Pure Chalet Thredbo offers renovated bed & breakfast accommodation in the heart of Thredbo Village. The property is a north-facing, 3 level traditional chalet featuring mountain views from all rooms and private on-site parking. Kosciusko Express Quad Chair is 300 metres from Pure Thredbo Chalet. All rooms at Pure Chalet are spacious and feature independent room heating, parking and renovated en suite bathrooms with underfloor heating. There is a communal living room and dining area and guests can enjoy home cooked breakfast made from local quality produce. Other facilities at the property include a drying room, a special snow-boot dryer and an area to store bikes, skies or snow boards. A village shuttle bus is also available to take guests around Thredbo Village. When would you like to stay at Pure Chalet Thredbo ? This room features a cable TV. This family room has a sofa, seating area and flat-screen TV. Each day we'll check prices and send you an email for your selected dates at Pure Chalet Thredbo. If you don't have specific dates but would like to check prices for say next weekend or say next month we can check the price too. 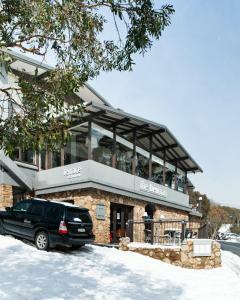 Click to write a review and share your experience of Pure Chalet Thredbo with other travellers.